Think you can’t run? Well that’s just not so. Anyone can take up running and learn to love it too. To non-runners the running world can seem intimidating. All this talk of marathons, energy drinks and time on a treadmill can frighten many newbie runners off, but it doesn’t have to be this way. It’s actually a great way to switch off from every day pressures and many of our readers tell us it’s the only time in their busy days when they get time to themselves in between juggling their jobs, children and the housework. It’s a cheap sport to take up, you can fit it in to your day at a time to suit you and you will see an improvement in your fitness very quickly. Yes, providing you have a clean bill of health from your doctor there is no reason why you can’t run. By starting off with lots of walking interspersed with a little running, anyone can build up to a 5k distance in ten weeks or less (click here for an easy to follow 5k training plan for beginners). If you are new to running but already fit from other activities you will be able to build up to 5k much quicker. 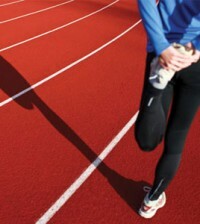 The benefits of running are huge; the sport can help improve cardio fitness, lower blood pressure and lower cholesterol. It’s also an excellent way to maintain fitness whatever your regular sport of choice. Many people also find it a great stress reliever and enjoy pounding the streets listening to music or running through parkland with just their own thoughts for company. There’s no right and wrong time of day to run so choose a time that fits in with your diary. This is one of the joys of running, and something that makes it easier to stick with than other more regimented sports. There is much debate about the right way to warm up and cool down. We recommend five minutes of dynamic stretches (star jumps, lunges etc) beforehand and then five minutes of gentle stretching at the end to cool down. Ensure you stay hydrated by drinking water gradually throughout the day. When you are just starting out on short runs you won’t need to carry water with you unless it’s very hot. 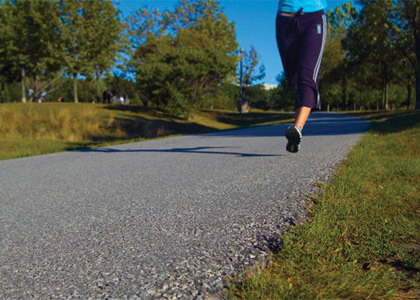 Don’t go running on an empty stomach, but likewise don’t go after a heavy meal. Also be careful about ‘carb loading’ as a beginner runner; it’s only when you start to up the distances that you need to think about taking on extra fuel. Keeping a diary of your runs will help you to track your progress and keep you motivated. Make a note of how long you went for, how far you went and how you felt during and after the run. Safety is a priority, so think about running with a friend and take popular routes with lots of other runners. Running in the dark is sometimes hard to avoid, especially in the winter months, so wear hi-vis kit and stick to lit areas. When you first start running it’s not unusual to experience some discomfort, but don’t put yourself off early on by pushing too hard. Do some run/walk sessions until you build up your confidence. You could get a stop watch and do a timed session E.G. 5 minute walk, 2 minute jog, 3 minute walk, 2 minute jog, 3 minute walk, 5 minute jog, 5 minute walk. Or you can go with the flow and just run/walk as you feel – there are no rules. As you get more confident you can shorten the walks and push yourself on. Many novice runners experience stitche but you may find they stop as your fitness increases and your abdomen gets more used to be jigged around during a run. Try to focus on taking deep, even breaths and exhale fully. You can also try placing your hand into the right hand side of your middle and push up, this lifts your liver up towards your diaphragm and stops the ligament here being stretched, which causes the stitch. In comparison to many sports, running is relatively cheap to get started in. The only essential items you need are a well-fitting pair of running shoes and a good sports bra. It is best to go to a specialist running shop and seek expert advice on your footwear as wearing the wrong shoes can lead to injuries. Many stores offer free gait analysis which will help determine what level of support and cushioning you need in a shoe. Likewise being specially fitted for a sports bra is also recommended – head to your local Sweatshop (www.sweatshop.co.uk) store for a free fitting. In addition to this, sweat wicking gear is best and depending on the time of year opt for shorts, capris or full length tights. Thin layers are a good choice and a waterproof jacket will help on wet days, but this isn’t essential especially when you are just starting out. A good pair of specialist running socks will also help prevent blisters. 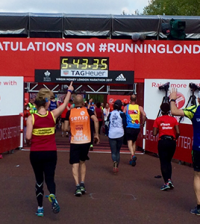 Nick Howard from Run England told us, “Joining a running group is a great way to inject a social element into your running as well as help you improve in fitness. Running can be lonely, but knowing you are meeting someone who shares your passion – on some or all of your runs – is a great way to have fun and stay motivated. Regardless of your age, location, size, shape or fitness level, visit www.runengland.org/groups to find your nearest running group and www.runengland.org to sign up with Run England and receive special offers on running shoes and other kit. What about signing up for a race? It might seem daunting to a novice runner but there are all kinds of running events on offer and having a date marked on the calendar will act as great motivation. 5k is a manageable distance for everyone and there are lots of different events, with many now women only, across the country. Think about the distance you’d like to do and look for events local to you. If you want to run for charity contact your preferred one and see what events they are organising or have entries for. Also check out your local Parkrun, these are free timed 5k runs that take place across the UK every weekend (www.parkrun.org.uk). If you are nervous about taking part in a big event these can be a great introduction to the running scene.